More people are concerned and anxious: the future of our planet is on the line. The recent IPCC-report claims we have only 12 years to avoid irreversible environmental disaster. Despite the warning signs, the political establishment do not seem to grasp the seriousness of the situation. Many workers and youth do understand the need of urgent action. 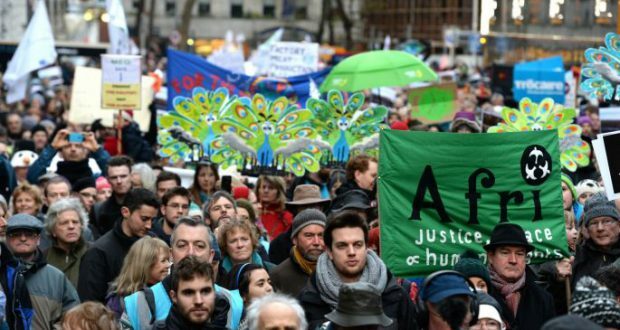 An historic climate march in Brussels on 2 December confirmed this: more and more people do not accept the failure of the governments to do something to stop climate change. Tens of thousands of demonstrators kept arriving at the start of the march. More than two hours after the first protesters had left the square in front of the Brussels North station, others were still arriving. The size of the march reminded us of the big trade union demonstration in October 2014 or the anti-Iraq-war demonstration in 2003. The police said 65,000 participated. The organisers thought it was 75,000. It is difficult to make a correct estimation, but when we compare last Sunday with other big demonstrations it is not exaggerated to say that possibly there were 100,000. The rain did not stop the enthusiasm of those participating – some more sunshine would have resulted in an even higher turnout. Amongst those present were many families with children and many young people. The issue of climate change and the struggle against its causes is now on the political agenda. The question is how to get an effective result. 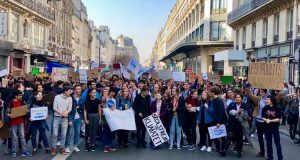 On a broad-based march like the Brussels event, there are, of course, many opinions about climate change. Some plead for more individual measures, for example, demanding extra taxes on airplane tickets. But if something was made clear by the protests of the ‘yellow vests’ in France and, to a lesser extent, in Belgium, it is that working people already pay more than enough. There were some yellow vests protesters on the climate march: arguing that protest against high prices for fuel does not mean defending more pollution. This was an outcry of anger against the fact that we always have to pay more while our wages do not follow. The protests should be used to demand higher wages and investment in alternatives, like public transport. Train tickets are way too expensive! There is a growing search for collective answers on the climate crisis. Many people make efforts in their personal lives but are conscious that this is not enough. They see that those who are really responsible for climate change are not prepared to make similar efforts. As long as big companies dominate sectors like energy, this will not change. Climate summits can issue with as many good intentions as they want, but they do not bring real change. And even the intentions are not good enough. There is a growing demand for structural change measures. But the community cannot control what it does not own. We should put energy and other strategic sectors in public hands, under democratic workers’ control and planning, and start a massive programme of public investment in science and research to development green energy. ‘Green capitalism’ is not a solution. It has been tested and failed. Consumption is not independent from production. Any measures regarding production immediately confront the desire for profits of big companies. The Belgian bosses’ federation, VBO, warned that too ambitious climate goals “shouldn’t harm our competitive position.” Initiatives on a small scale are out priced by the big companies and when they become successful, they are bought by those big companies. That happened with Lampiris, a green energy supplier in Belgium. The company became successful and is now part of the French multinational, Total. In contrast to the chaos of capitalism, we are for a socialist alternative: a society where the majority of the people decide on what is produced and how. Only in such a society it will be possible to defend the interests of those who are responsible for all the wealth: workers and the environment. To break the dictatorship of big business, we need to unite forces. Last Sunday’s climate march was an excellent step in that direction. Change has always been obtained when the working people get organised and fight. When we start to achieve fundamental collective solutions will depend on the role of the working class in the climate change movement. The workers’ movement has the keys to the economy. 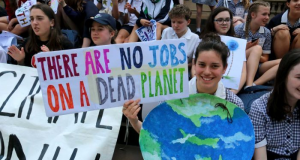 With a serious struggle to change society and to end the chaos of capitalism, the workers’ movement can take the natural resources and the means of production out of the hands of those responsible for climate change – the capitalists. On the basis of workers’ democratic control and ownership, in the interests of society, as a whole, the environment can be protected. LSP/PSL, the Belgian sister organisation of the Socialist Party, had a lively youth contingent on the demonstration. We called for collective solutions, like free public transport, energy in public hands and we called for socialist change instead of climate change. Our members participated with street stalls. We sold 105 copies of our paper and collected over 400 euro fighting fund selling badges. Dozens of people gave their contact details to continue the dialogue we started with them on the march. 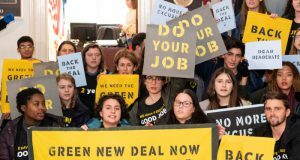 The (green) energy of this climate march strengthens us in our struggle for a new society – a socialist one!